It was all going well until I decided that I would hang up my pastels for a little while. If you know my work, you know that I love pastels and usually shy away from bright, bold colors. But something about the Konnichiwa collection from Basic Grey called out to me and I couldn't resist. I've been meaning to do something with my stash of felt for a little while now. This seemed like the perfect time to dig into all the fuzzy-ness. I was looking for a cute little baggie that could hold some fun mom-day gifts, but couldn't quite justify using a plain paper baggie...So I pulled out my white felt, gave it a few mists (be careful - it takes quite a while to dry - and until it is completely dry, the dye comes off quite easily!) 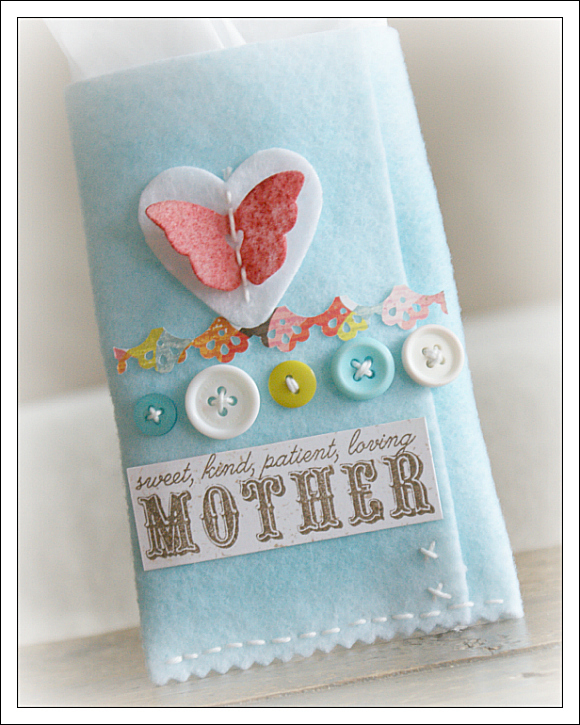 and hand-stitched this little baggie. I happen to be a very mediocre seamstress...In fact, I've pretty much given up all hope for my sewing capabilities. So if I could pull this off, I am certain you could too! 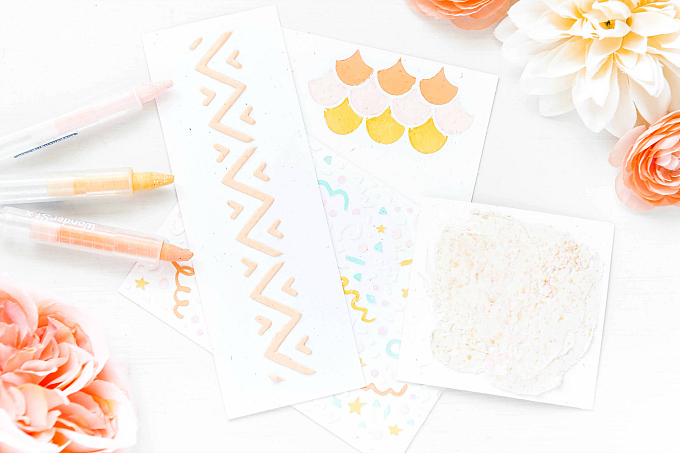 I hope you give it a try...It really is quite fun making little treasures like this and stepping away from paper. For just a little while, at least. To help myself out a little bit, I only stitched the bottom portion of the baggie and the two 'x' stitches, then I used Scor Tape to bind the seams together :) Easy peasy! Before I pulled the baggie together, I stitched some buttons on the front of the felt. Much easier option than trying to stitch them on when the baggie is finished. I used a heavier floss so that it could hold up to the thick felt. 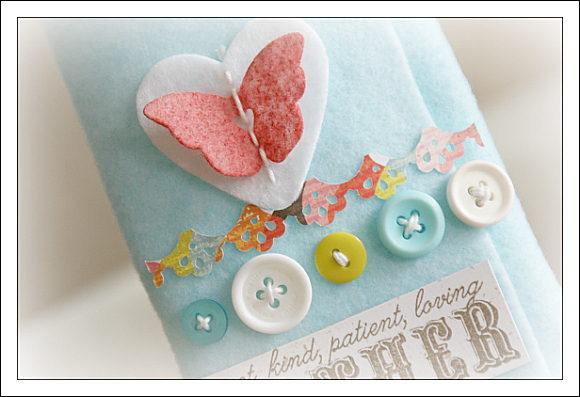 For the butterfly, I used this Papertrey Ink die, and this die for the heart. Then I misted the butterfly and stitched it to the heart. 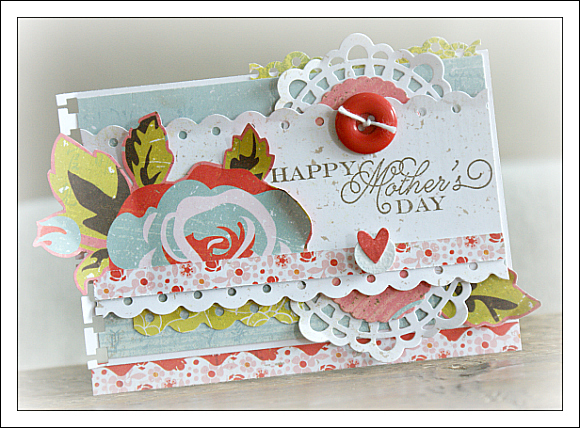 I used the Mother & Father stamp set for the sentiment and more Scor Tape to adhere all the bits together. 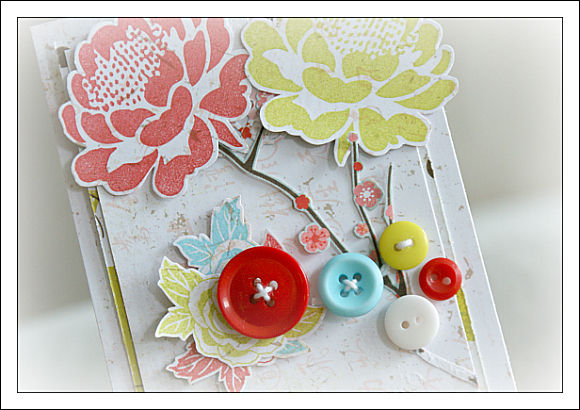 Here is a card I've created to go along with the baggie. I tested out the Prima fluid chalk ink here (ladybug, turquoise stone, and rock moss). I found the colors very vibrant and easy to work with. I loved that the colors were a perfect match for the Konnichiwa collection. 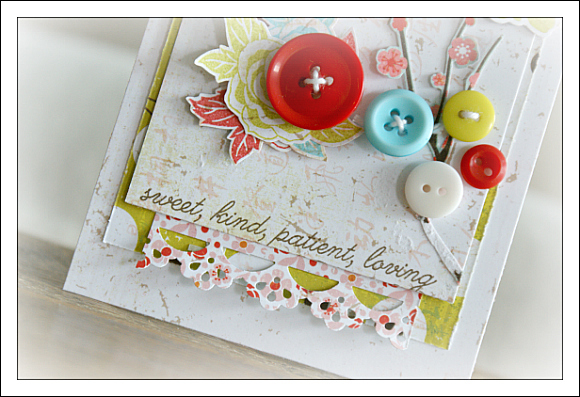 Used a few vintage buttons and a stamped phrase from the TCM Mother & Father stamp. 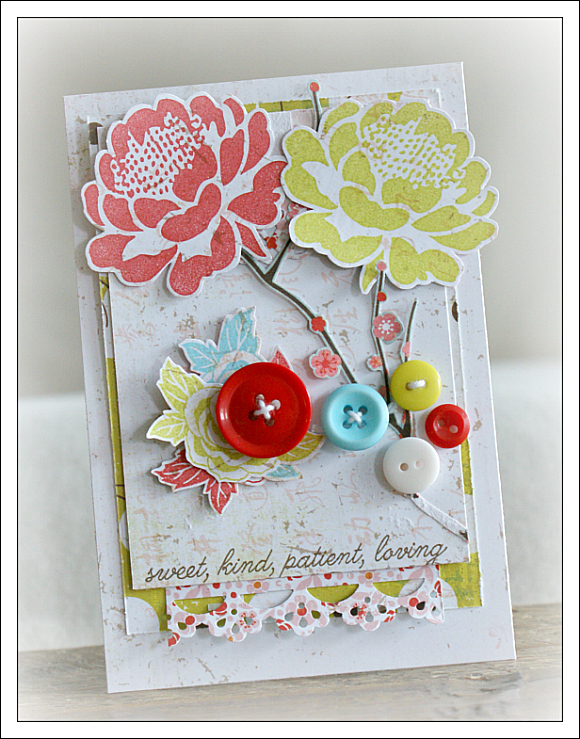 Decided to use another stamp from the same set, and some lovely layers of pretty papers. I know it's a bit early, but it's never too soon to be ready for one of my fave days of the year! 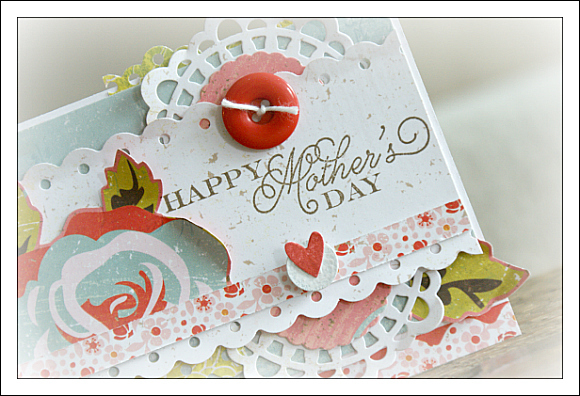 I love mother's day because I get to celebrate someone so special to me. 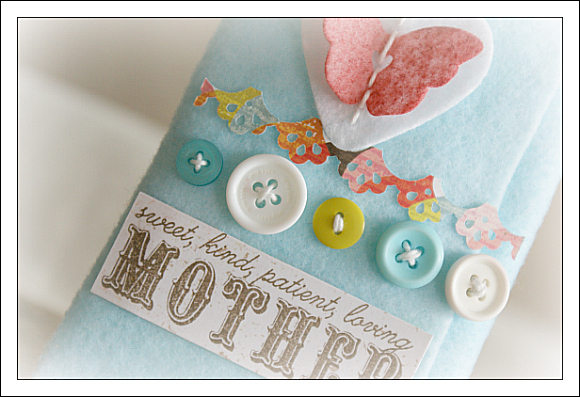 I have a few little mom-day projects up my sleeve. Off to create a little more. I will be back with the rest of my creations tomorrow! 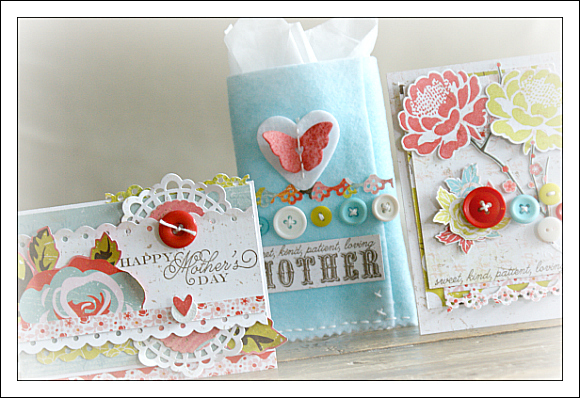 These are gorgeous, Im loving the Basic Grey paper the colours look stunning. Love all the little details you add to your work.